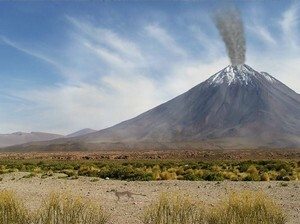 Since a suricate meanders across the screen, there may be no worries about the smoke from the volcano heading this way. However, you can watch which way the fog and smoke are floating from your desktop. The grasses bend with the rumble or the mountain and stiff breeze.